The Crystal Quest Commercial Reverse Osmosis 1,000 GPD Water Filter System ruggedly designed and manufactured for dependable and simple operation. These units provide a higher output of continuous quality demineralized water for many industrial applications such as restaurants, pharmaceuticals, bottled water, plants, coolant or chemical mixing, and the list goes on. RO units are completely assembled and shipped ready for a trouble-free installation and startup. All units are factory tested prior to delivery to ensure quality and performance. 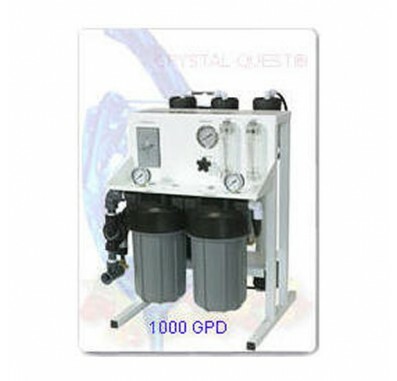 CRYSTAL QUEST Commercial Reverse Osmosis 1000 GPD Water Filter System features all of the following: Three 2.5 inch x 21 inch TFC membranes, 3.2 GPM brass rotary vane pump, coupled directly to the motor, 1/2 HP motor--110 Volts 60 Hertz or 220 Volts 50 Hertz, Aluminum frame, white powder coated, corrosion resistant, and lightweight, One 4.5 inch x 10-inch 5 micron sediment and one 4.5 inch x 10-inch carbon block Prefilters, One 2.5 inch 0-300 psi panel gauge and two 1.5 inch 0-160 psi top mount gauges, Low pressure switch (Safety device to protect the pump from running dry), Solenoid valve with manual override. 110 Volt 60 Hertz, or 220 Volt 50 Hertz, One 1/4-inch brass needle manual flush valve that regulates the product to waste ratio (system recovery), and a Manual on/off switch.